By LUDWIG VON KOOPA - It's unfortunate. “See the screenshot above? There is a Fan card at the very left, a bit off-screen. At the right, there is another Fan card — a replica. We know nothing about replica Thing cards besides the above screenshot, but it proves that you can have more than one Thing card in your inventory at once. Whether replicas are exact copies or are weaker remains to be seen, but this already seems to solve a problem, does it not? All the Intelligent Systems team needs to do is make the overworld puzzles not totally weird that you have to look up the solution to figure out the team's logic. Also, make boss battles either possible without needing to use Things, or make them not a total pushover if you do use them. That's a balancing issue, though. Not a fundamental game design issue. Okay, PARTS of that are very true. The game DOES do a good job making sure you know you have the right thing. There is a dedicated, unique Toad in Prism Plaza just for that purpose, and a Toad right next to him to make sure you can acquire that Thing by buying it with your overflowing amount of coins. This also makes the whole guessing-the-game's-logic point null, since, at least so far, it's pretty obvious what you need to do. So, the wrong part? Well, the article's title should tell you, and I'll go into detail. Keep in mind my experience is solely up to obtaining the Big Red Paint Star. So... things could change, and hopefully they do. First of all, you do need the Fire Extinguisher to beat Paper Morton. His Fire Mallet does 48 damage, and you're locked to having 50 HP versus him. (You get an HP upgrade AFTER you beat him.) It turns out that blocking does NOTHING. 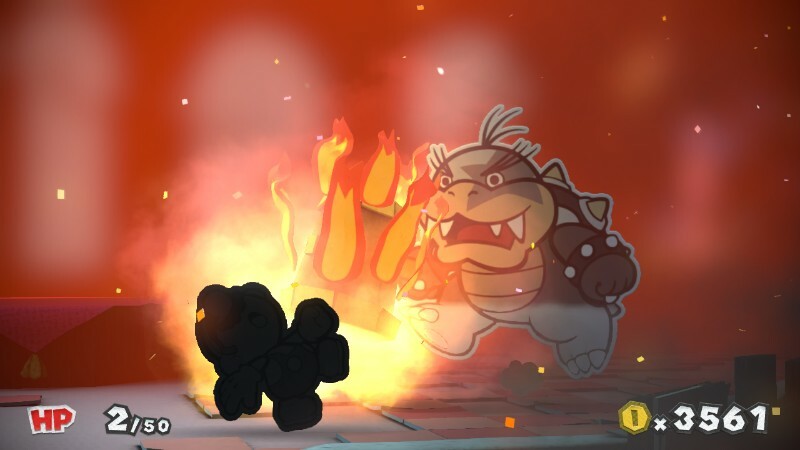 I'm pleased that Morton can pierce Mario's block with the power of fire... I guess? Mario, at this point in the game (I have no idea if this changes later on) can only perform up to two cards a turn, and Mushroom cards only heal 40 HP. 1-Up Mushrooms don't exist in the sense that they do in previous Paper Mario games: Rather than revive you, they restore all of your paint. So, you're left with 2 HP. You can do two very powerful attacks, but Morton just has too much HP at this point in the battle, since he goes Fire Mallet pretty early. Afterwards, you're out. You can heal with a Mushroom and get to 42, and then attack with another card. Next turn, you get a game over from a Fire Mallet. This is apparently what happens when you get a game over in Paper Mario: Color Splash. I can't confirm whether or not Red Slurp Guys do this all the time, or just for this boss. So. You NEED the Thing. Fortunately, it happens to be true that the Thing card is not an auto-win. It's just avoiding an auto-lose. If you don't add any paint to the Fire Extinguisher Thing, it turns out not to do much damage. So, the fight against Morton continues, with him having potentially plenty of HP left! ...Unfortunately, and this may be just for Morton, but the fight post-Thing usage involves him whacking you with a very weak stick. Morton's stick, which was at one time, a very beautiful magical wand, only does 1 damage per whack, even unblocked. So... I guess he can still win, but it's hard to imagine how besides Mario wasting his turns with 1-Up Mushrooms. Or he keeps using Enemy Cards, which are literally a form of slavery in this game. So there's not much to the fight after you're forced to use the Thing. That makes the battle a very obvious puzzle instead of a winnable, hard-fought battle on both sides. As for Replicas? ...Those don't count for boss battles. Replicas apparently serve a purpose, just not in boss battles! (Though, now I want to see what dialogue all of the other bosses will have when you pull a Replica Thing on them.) They aren't exact copies in that one fails and the real one doesn't, but in any other NORMAL battle they are exact copies. ...At least, in effect. You don't need Things for normal battles. To conclude: Replicas don't solve the Museum/boss battle dilemma. (Museums don't accept fakes, as common sense dictates.) You do need the required Thing to go through boss battles, and they do apparently “dumb down” (by design) at least SOME of the boss battles. (One of one, though it's a small sample size!) 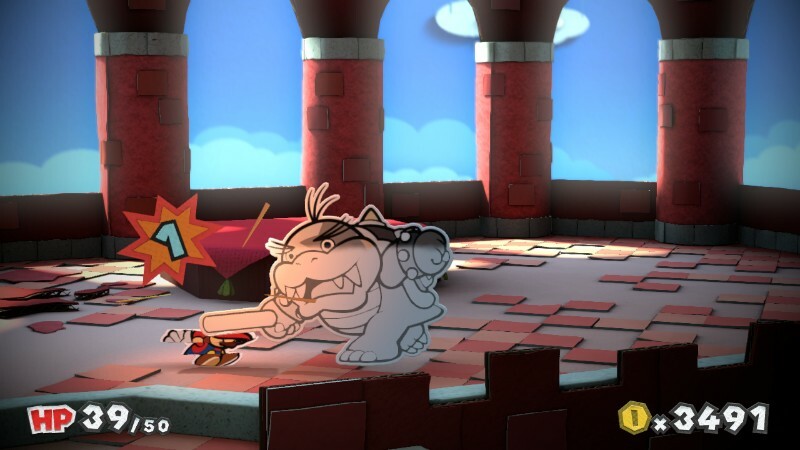 However, unlike Paper Mario: Sticker Star, Paper Mario: Color Splash is very transparent about what is needed of you. ...Also, everything else about the game that doesn't involve gameplay, so far, is amazing. Ludwig is posting his Paper Mario: Color Splash experiences over on Miiverse, and unlike many other people, he keeps his thoughts in one post. (But he'll move to a new one when required, or to dedicate a post to himself.) He doesn't know if he's on track to finish the game and review it before 2016 ends. For the backstory of why Morton Koopa Jr. acts the way he does in Paper Mario: Color Splash, please watch this music video. Ludwig writes about his own boss battle and level very extensively in this article “reviewing” it. Ludwig then reviews the entire game here, and maintains what he said in the last sentence of this article. 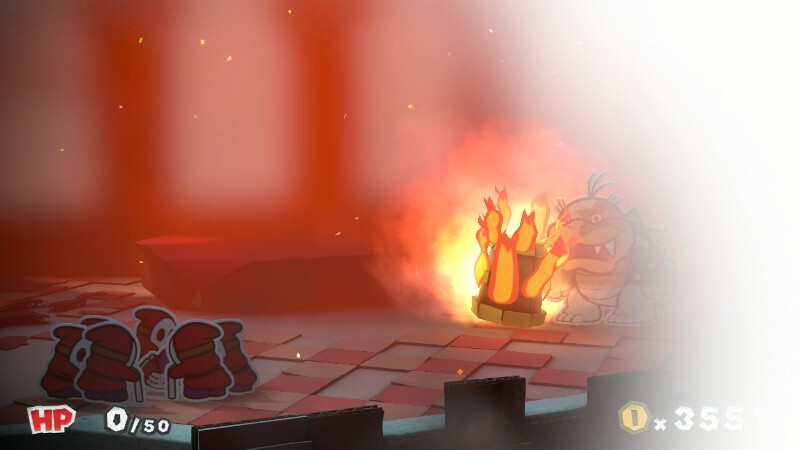 Mario should be reduced to ashes with one hit of the Fire Mallet. Morton needs to upgrade his arsenal. If only badges were in the game, right? Two Power Plus badges would do it! Or if only Morton's Shy Guy minions were sturdy enough not to be taken out in turn 1. I'm playing Color Splash for the first time, this article is exactly how I felt when I beat Morton, I was dissapointed because I was forced on using the Fire Extinguisher and after that Morton turned into nothing. Fortunately the rest of the bosses aren't like that, they just keep doing good damage after you stop their little own game with a thing, but after that pretty much the battle is over. (I just beat Wendy btw, the game looks nice, can't decide if I like Color Splash or Super Paper Mario the best). 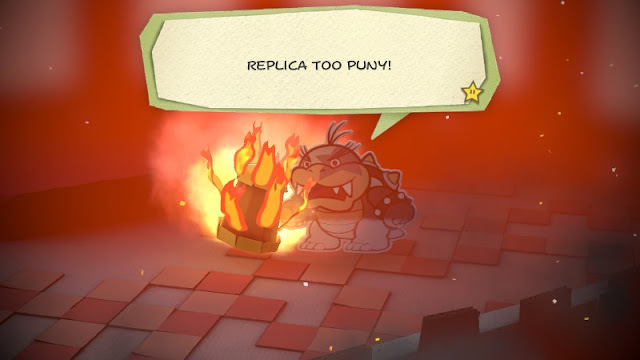 That's a fair point, and it speaks to Morton's personality that he's the only Koopaling to obviously be too demoralised/dumb/lazy to keep fighting without his Thing-removed gimmick.